The effort is intended to help propel and sustain the Department of Chemistry at Hope as the premier chemistry program among liberal arts colleges nationally. It’s also intended to build the next generation of leadership in chemistry. The gift is through the college’s “A Greater Hope” comprehensive campaign, which among its initiatives emphasizes providing support for faculty scholarly activity. The program will provide unrestricted funds to advance the research agendas of those chosen as fellows. 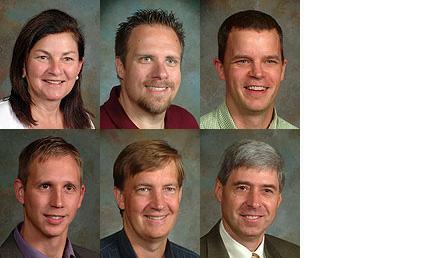 A total of six faculty have been named to multi-year appointments as Schaap Research Fellows. They were selected on the basis of their record of accomplishment in research scholarship as well as their skill as teachers in both the classroom and the laboratory. All of the six, as is true throughout the college’s Division of Natural and Applied Sciences, work collaboratively with Hope students on their research. The first six Schaap Research Fellows are: Dr. Maria Burnatowska-Hledin, who is the Frederich Garrett and Helen Floor Dekker Professor of Biology and Chemistry; Dr. Jason Gillmore, associate professor of chemistry; Dr. Jeffrey Johnson, associate professor of chemistry and Towsley Research Scholar; Dr. Brent Krueger, associate professor of chemistry; Dr. Graham Peaslee, who is the Elmer E. Hartgerink Professor of Chemistry and a professor of geology/environmental science; and Dr. William Polik, who is the Edward and Elizabeth Hofma Professor of Chemistry and chairperson of the department. Schaap, who graduated from Hope with a chemistry major in 1967, provided support for the fellows program because of his lasting appreciation for the high quality of his experience as a student and his desire to help provide the same for new generations. Following his time at Hope, Schaap received a Ph.D. in organic chemistry from Harvard University in 1970, joining the chemistry faculty at Wayne State University in that year. At Wayne State, he received an Alfred P. Sloan Research Fellowship, the Gershenson Distinguished Faculty Fellowship, the Sigma Xi Faculty Research Award and the President’s Award for Excellence in Teaching. He was elected to the Academy of Scholars and served as its president from 1992 to 1994. In 2010, Schaap was awarded an honorary Doctor of Science degree by Wayne State University. Schaap’s research at Wayne State focused on the study of dioxetanes (high-energy chemical compounds which can be triggered to generate chemiluminescence or light. While continuing his teaching and research efforts at Wayne State, Schaap formed Lumigen, Inc. in 1987 to commercialize the dioxetanes which had been developed in his research laboratory. Schaap began marketing Lumigen products in 1989. The dioxetanes are now distributed worldwide by major corporations because of their sensitivity, versatility, and stability as chemiluminescent detection reagents in life science research and medical diagnostics. In 2000 Schaap retired from his position as chemistry professor to become full-time president of Lumigen. In 2006 the Southfield company was acquired by Beckman Coulter, Inc., a major medical diagnostic firm. Schaap retired from Lumigen in 2007. The A. Paul Schaap Science Center at Hope is named in recognition of a leadership gift he made on behalf of the project. Hope presented him with a Distinguished Alumni Award in 2006, and he currently serves on the college’s Board of Trustees. The Hope College Chemistry Department is known nationally for its excellent programs in undergraduate research and education. In a study of chemistry programs at private four-year colleges published in the “Journal of Chemical Education,” the Chemistry Department was recognized as outstanding in the productivity of its research program and for the accomplishments of its graduates. Among other recent achievements, across the past five years a total of nine students have received scholarships or honorable mention in the national Goldwater Scholarship program and 12 recent graduates have received fellowships or honorable mention through the National Science Foundation’s Graduate Research Fellowship program. Its alumni are also well known, as Hope College chemistry graduates go on to earn a disproportionately large number of Ph.D.s in chemistry, as reported by the Franklin and Marshall study of Baccalaureate Origins of Ph.D.s. The Hope College Chemistry Department is also a nationally recognized leader in science education, typically graduating more than 50 chemistry and biochemistry majors each year. According to annual statistics published by the American Chemical Society (ACS), Hope College has led the nation in the number of chemistry major graduates per year for a liberal arts college for each of the past four years. The Chemistry Department has an exceptionally strong program of student-faculty collaborative research, offering one of the largest summer undergraduate research programs in the nation. Each year, more than 50 students participate in summer research with chemistry faculty. The department was also recently recognized by the ACS with the 2013 Stanley C. Israel Regional Award for Advancing Diversity in the Chemical Sciences, largely through its innovative collaborations with two-year college students that come to Hope College to conduct research.